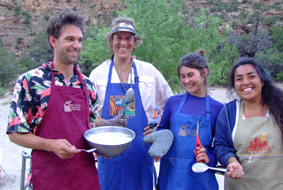 What makes the guides at Sheri Griffith River Expeditions so special? 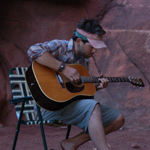 Experience: Our guides have spent an average of 9 years leading river trips in Moab, Utah and/or other locations around the world, and our most experienced guide has spent almost three decades (28 years!) leading river trips. 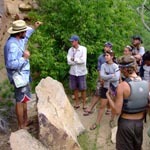 Training: Every guide on a Sheri Griffith River Expeditions trip possesses a current River Guide license, which means they have passed the top level of state licensing tests. Additionally, every SGRE guide completes a professional training program in the spring, which is a unique feature of our company. Any guides who are new to the company complete an extensive, company-specific training program prior to leading their first trip with us. This professional training includes Wilderness First Aid, Cardiopulmonary Resuscitation (CPR), Swift Water Rescue, food handler’s classes, and on-river cooking courses as well as geology and natural and human history of the region. New guides also learn the “Sheri Griffith Style” of customer service, and are required to run each stretch of river multiple times on their own before they are qualified to guide guests. The training for returning guides includes changes to trip itineraries, logistics, and company policies; tasty new recipes for trip menus, and any new research regarding the natural and cultural history of the region. We are the only river company that requires returning staff to complete training each year, ensuring that our guides will always have the most up-to-date information to help make your trip unforgettable. Personality: We only hire intelligent, outgoing, professional, engaging, knowledgeable and fun people! Our guides are a group with exceptional and diverse talents who are eager to share their knowledge, experiences, and passion for the outdoors with you. 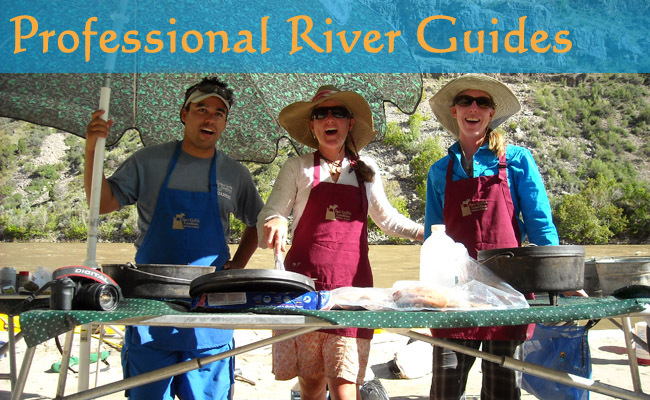 Passion: All of our river guides are truly passionate about what they do. In our opinion, too many river guides view their work as “a summer job” to fill time until other employment starts. 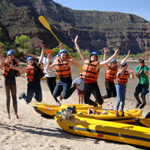 Conversely, we are one of the only companies to run Cataract Canyon rafting trips year-round, and all of our guides live in the Moab area (some have lived here for 30 years! ).Our guides continually strive to perfect their understanding of our region and its secrets. To them, being a river guide isn’t just a summer job, it is a way of life - and their passion is to share that way of life with you. We want to make it work for you. We know that no two people are alike and that what works for one person isn’t necessarily a good fit for another. We have carefully designed our services to be flexible and accommodating enough to provide an outstanding adventure for everyone. If you're on a special diet, we'll make sure you get what you need; if you want the trip to be a day shorter or longer (or need something we haven’t thought of), just let us know and we’ll be happy to work with you! We want to make a difference in your life. Our office staff is just as committed to your experience as our river guides. Sure, they will help with logistical details like sending brochures, giving you directions to the office, or reserving camping equipment for you; but what they love to do is listen to your desires and use their extensive knowledge to help you choose or design the perfect outdoor adventure. We want you to jump for joy! Our guides are skilled at maneuvering boats down rivers, leading hikes to ancient ruins, cooking fabulous outdoor meals, and taking care of all the logistics so that your vacation is fun and easy. Our guides are professional, knowledgeable, fun, and committed to creating the ambiance you need to feel comfortable enough to jump for joy!